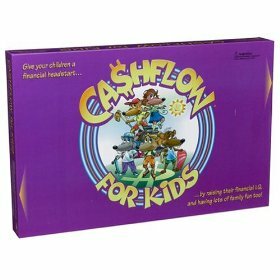 Children learn important financial strategies and principles as they play Cash Flow For Kids by Robert Kiyosaki. It is wonderful in that kids not only have fun - they learn as they play. Even Mom and Dad learned some things! Thanks, Karen! We've played the regular Cash Flow game with the kids, too. It's a lot like Monopoly in that you move your "Rat" around the board trying to get out of the "Rat Race". It's great when you get more money to finally pick from the "Big Deal" deck! That seems to be the secret to starting a fortune. Now if we could only duplicate that in real life. Have you figured that out yet?! We've played and have applied some of the principles to our lives. We bought a duplex which helped to increase our monthly cash flow. That enabled us to pay it off with our renter's money. We should have been looking for "Big Deals" these past few years. I guess now's as good a time as any!